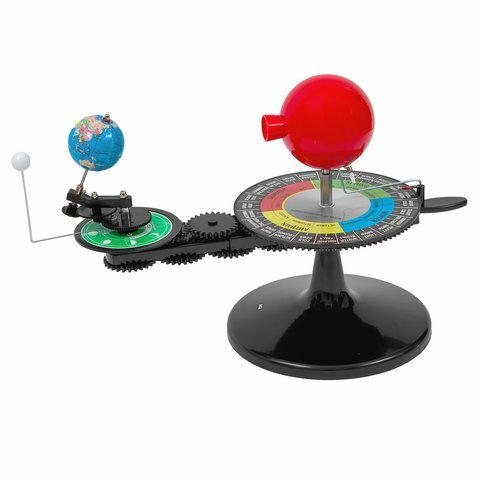 A perfect device to explain the peculiarities of the planets, rotation of the Earth, and the phenomenon of seasons. Japanese brand. Artec Sun, Earth and Moon Device is a kit for individual assembly that helps to learn about planets and their motion in space, the change of seasons on Earth, change of day and night and different Moon phases. This kit is to be assembled according to the user guide provided. By rotating the handle, you can move the planets. This set is also equipped with a small bulb. Diameters of the planets: Sun - 100 mm, Earth - 55 mm, Moon - 19 mm. Power source: AA batteries (2 pcs. not included). Learn about planets or the Solar System and different phenomenon. Great illustrated, interactive, and informative study guide included in kit. Great for STEM (Science, Technology, Engineering, and Mathematics) related curriculum. parts to assemble planets — 1 set. AA batteries – 2 pcs.